Find the perfect combination of comfort and convenience in this new 4 bedroom, 3.5 bath cottage. With a gorgeous view of the cove and just steps away from all the lakefront amenities, how could you beat this perfect location? 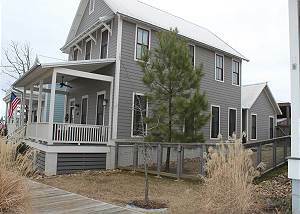 This 5 bedroom and 4 full bathroom cottage is perfect for family getaways. 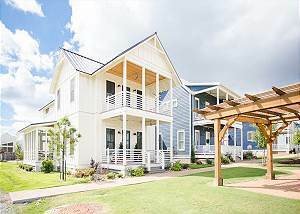 With porches on both levels and a back screened porch, as well as a great view of Redbud Park, there is plenty of space for relaxation, play and time spent together! This new build offers unique spaces for both the adults and children. It's great location gives easy access to fun activities for the family. Being the closest cottage to the waterfront, you'll be the closest to all the actions, including the boat dock, swim beach, food trucks, and pop up shops. When you're ready retreat back to your cozy cottage with spaces for everyone to relax. The perfect place for the whole family and just a short walk to the pool and other activities. Spacious cottage with tremendous views of Lake Eufaula. Right across from Carlton Landing's walking trails. Minutes from the Community Pool, dock area and park areas. Open floor plan, 4 bedroom, 3.5 bath, with space for 14 to sleep! This gorgeous home provides the perfect combination of luxury and convenience. Great spaces for the entire family and more, but feel free to take the party outside to the home's personal fire pit and porch right off the lovely Redbud Park. Relax with plenty of space for the whole family in this 4 bedroom home. Choose from indoor and outdoor dining options and spend your evenings watching the sun set on the front porch or balcony. Perfect place to unwind and relax. What a packaged deal nestled in the Cottage Court area! From the main house to the guest house, everyone can find the room for them and meet in the middle around your own private pool.